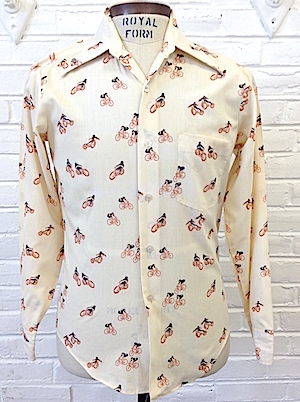 Home > Men's Vintage Shirts > All Men's Vintage Shirts > (S) Mens Vintage 70s Disco Shirt! Cream w/ Lil Blue, Brown & Orange Bikers! Mens vintage 1970s disco shirt. 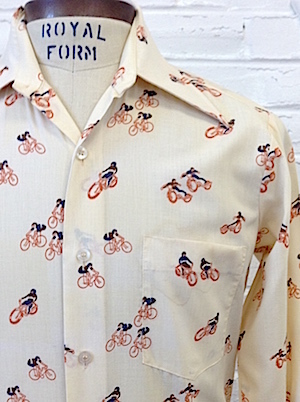 Cream colored shirt with little brown, blue, and orange bicyclists and motorcyclists! Has a super wide & pointy disco era collar. Closes in the front with pearly white buttons with one matching button on each cuff. Shirt has one chest pocket and a tapered hem. Tagged by Fruit of the Loom. Poly/Cotton blend. Condition: Very Good. Has a very light gray, water like stain on the chest pocket.